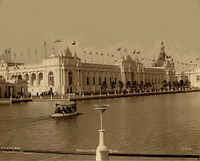 Sorely disappointed that he was unable to design a building at the World's Columbian Exposition in Chicago in 1893, Gilbert had his first opportunity to work on a building for a world's fair—officially the Trans-Mississippi and International Exposition—in Omaha, Nebraska, in 1898. The American Renaissance, Beaux-Arts inspired design (although smaller in scale) would have fit perfectly in the White City. 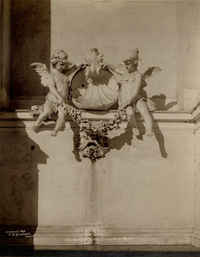 The building was constructed of staff, a mixture of plaster and straw, as were most temporary exhibition buildings of the era. 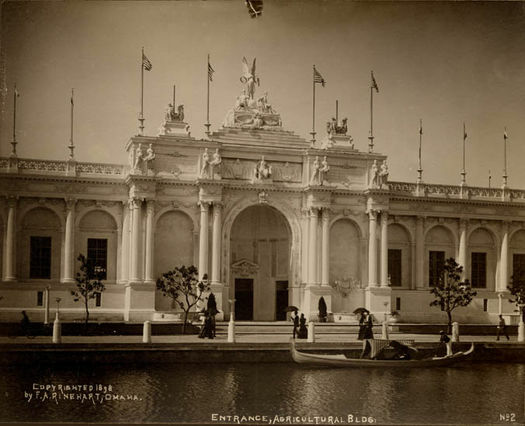 Like the Chicago fair, the Grand Court of the Omaha fair was organized around a lagoon. 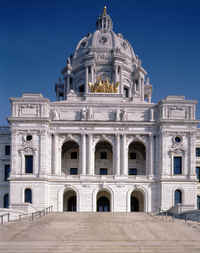 The triple-arched entry is a motif Gilbert used on the Minnesota State Capitol, which broke with a tradition of placing a Greek temple front at the entrance of important civic buildings. Both the Omaha building and the Minnesota Capitol with the juxtaposition of pavilions, arcades, and sculpture are characteristic of the Beaux-Arts style.